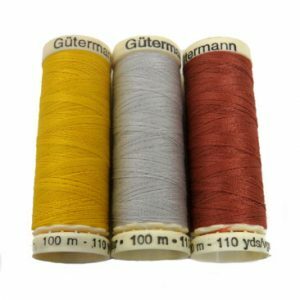 Passing thread is couched down singularly in the same colour sewing thread or a contrasting colour. 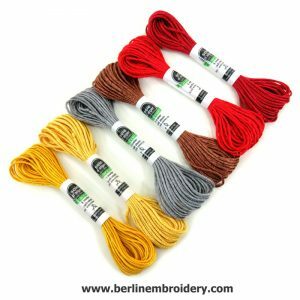 Passing thread is often used for Or Nue (couching down the passing thread with different colour threads to create a design or pattern on the surface of the passing thread) and underside couching. No. 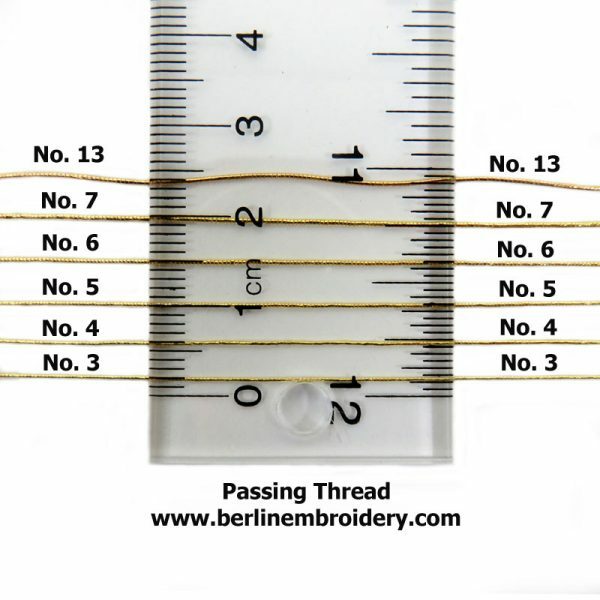 13 Passing threads are synthetic and will not tarnish. No. 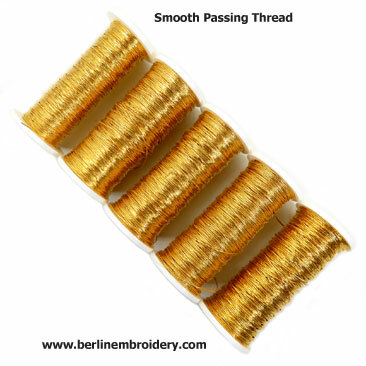 3 smooth passing thread is the finest of the range approximately 0.25 mm across the width of the thread. No. 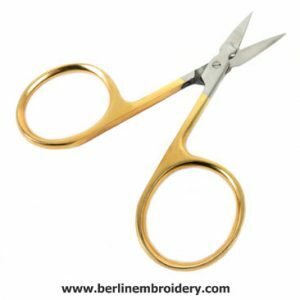 4 smooth passing thread is approximately 0.35 mm across the width of the thread. No. 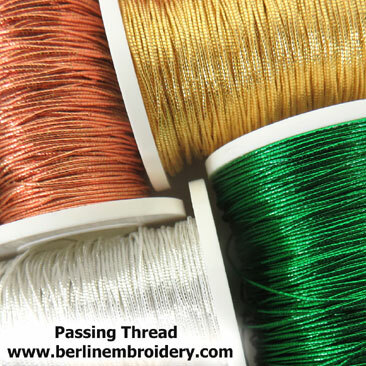 5 smooth passing thread is approximately 0.5 mm across the width of the thread. No. 6 smooth passing thread is approximately 0.7 mm across the width of the thread. No. 7 smooth passing thread is the thickest of the real metal passing threads and is approximately 0.8 mm across the width of the thread. No. 13 passing thread is the thickest of all the passing threads and is approximately 0.8 mm across the width of the thread. The No. 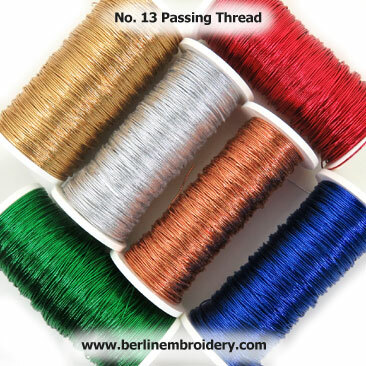 13 passing thread is a synthetic thread and will not tarnish over time. Passing is made up of wire wrapped around a fibre core. 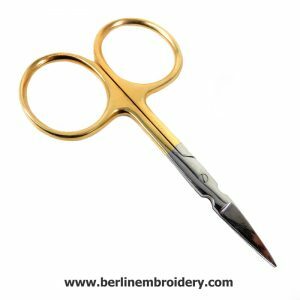 The thread is straight and smooth in appearance and turns corners easily when using fine tipped tweezers. 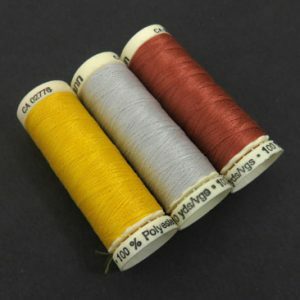 Passing is couched down singularly in the same colour sewing thread or a contrasting colour. 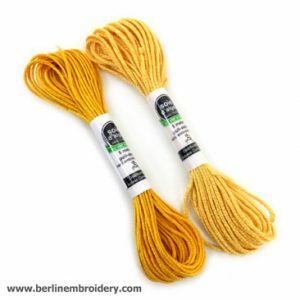 Passing thread is often used for Or Nue (couching down the passing thread with different colour threads to create a design or pattern on the surface of the passing thread) and underside couching. All passing threads will tarnish accept the No. 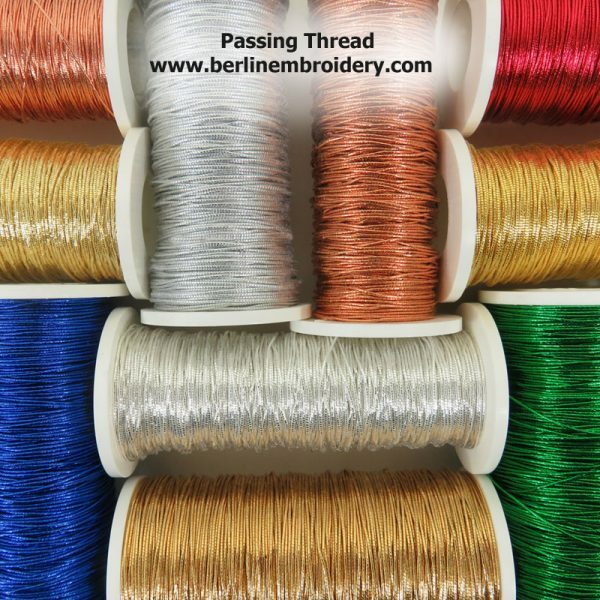 13 range of passing threads which are synthetic and come in a variety of colours.